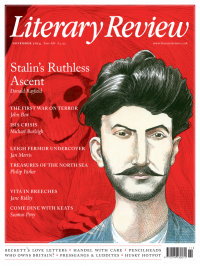 All but a few crumbs of the available archive materials have been studied, every political and psychological theory has been applied, filters of every colour – whitewash, deepest red, pitch black – have been inserted into historians’ lenses: after the revelations of the last twenty years, little fundamentally new can be said about Joseph Stalin. Psychopaths of Stalin’s order arise so rarely in history that forensic psychiatry has few insights to offer. There is now a general consensus about the death toll and the ghastly heritage of Stalinism. All that is left to dispute is the mechanism by which Stalin grabbed and held on to power and, of course, the various ‘what ifs’ that arise from considering a scenario in which he failed to do so. Largely on this basis, Stephen Kotkin presents us with nearly a thousand pages which promise to comprise but a third of a definitive work on Stalin and his rule.